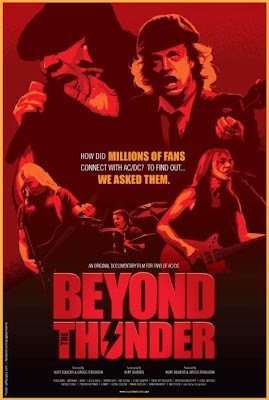 “Beyond The Thunder” is a documentary film by Kurt Squiers and Gregg Ferguson about the tremendous influence rock band AC/DC has had on our culture around the globe. The two producers/directors dropped their careers in order to make this film, which pays homage to one of the greatest bands of all time in such a way that has less to do with the band members themselves, and more to do with the common bond that ties fans together around the globe. A new video released by Squiers, as featured in Adweek, includes Anomaly's Mike Byrne, Gary Koepke, CEO of Modernista!, and David Baldwin, Founder of Baldwin&. The clip reveals never-before-seen footage from “Beyond The Thunder” about how advertising agencies utilize AC/DC's iconic music to give brands their :30 second spot even bigger balls. Despite lack of response from AC/DC's management, “Beyond The Thunder” has won for its promotional trailer at the 30th Annual Telly Awards, was featured in Adweek, SPIN, Kerrang!, Talking Metal, Shockwaves Radio and Classic Rock Magazine. “Beyond the Thunder” was also previewed in London during The Classic Rock Magazine awards in front of The Who, The Rolling Stones, Black Sabbath, Aerosmith, ZZ Top and Led Zeppelin, among others, as Kurt Squiers accepted the fan award for AC/DC's “Black Ice” for Album of the Year. An early cut of “Beyond the Thunder” has been screened at the Heavy Metal Film Festival in Los Angeles, Melbourne Arts Centre, Brisbane Gallery of Modern Art and the AC/DC-endorsed, exclusive exhibition entitled 'AC/DC Australia's Family Jewels' in Melbourne, Sydney, throughout Australia, Scotland's Kelvingrove Gallery, and Seattle's Experience Music Project Museum. The producers continue to seek a partnership and permission with AC/DC's management for a world-wide commercial release.